BEIJING: Chinese President Xi Jinping on Wednesday promised Pakistan Army chief General Qamar javed Bajwa that his country would continue to work with Pakistan and support it as a strategic partner. The assurance was given during a meeting between the two leaders on a special invitation by the Chinese president, the Inter-Services Public Relations (ISPR) said in a statement. During the meeting, both sides discussed the regional security environment, challenges and way forward, the statement said. Speaking on the occasion, the Chinese president said, “Pakistan is our time-tested friend and the Pakistan Army has a pivotal role towards this lasting relationship.” He appreciated the professionalism of Pakistan’s armed forces and acknowledged its role towards regional peace and stability. The president said that China will continue to support Pakistan as a strategic partner, adding that those who oppose Belt and Road Initiative (BRI) or CPEC shall never succeed as this is an initiative of peace and development not only for China but also for the whole region and beyond. 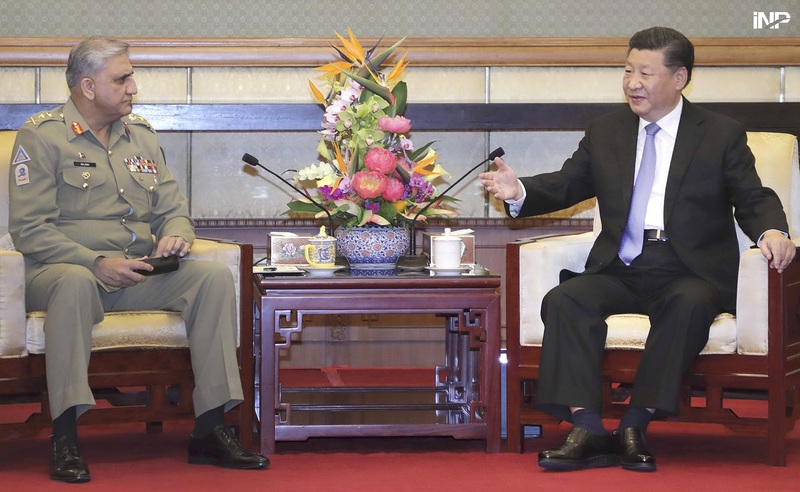 Gen Bajwa thanked Chinese President Xi for his invitation and for acknowledging professionalism and contributions of Pakistan Army towards regional peace and stability. The COAS said that Pakistan understands the importance of peace and has given a lot of sacrifices for achieving it. He said that BRI with CPEC as its flagship project is destined to succeed despite all odds, adding that the Pakistan Army will ensure the security of CPEC at all costs. Gen Bajwa returned to Pakistan on Wednesday night after completion of the visit. The visit of the army chief comes after international business magazine Financial Times (FT) reported that Pakistan has mulled over ‘reviewing CPEC’ agreement with China, citing Islamabad’s unease with what it claims is unjust benefit being enjoyed by Beijing-origin companies. According to the FT’s claim, Chinese Foreign Minister Wang Yi, who was in Pakistan, indicated his country’s willingness to have discussions pertaining to the CPEC again. In this regard, options to extend the loan repayment period, among other plans, were being pondered upon. Reacting to the report, Chinese Foreign Ministry said that CPEC is not under any review and both the countries have agreed to strengthen bilateral ties in all fields, adding that Beijing will continue its support to Islamabad and both countries have agreed to accelerate the CPEC plan. Later on, Gen Bajwa told Chinese Ambassador to Pakistan Yao Jing that CPEC is the economic future of Pakistan and there will be no compromise on its security.